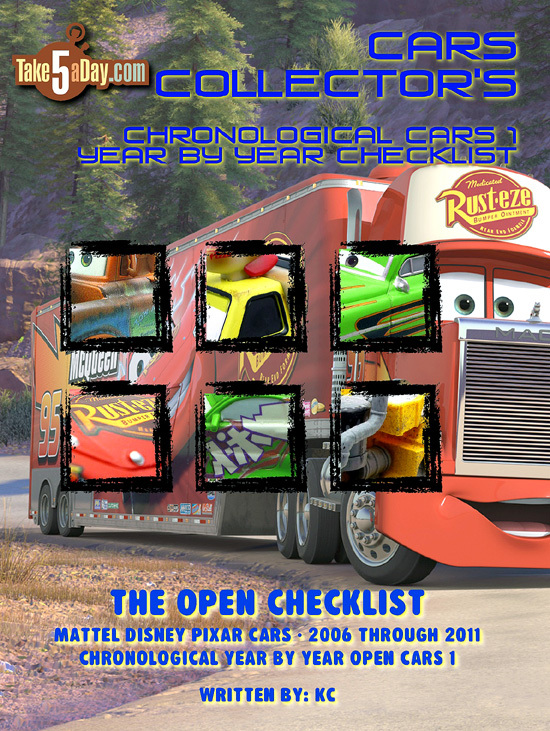 Take Five a Day » Blog Archive » Mattel Disney Pixar CARS: The Year by Year Chronological Checklist + SALE! 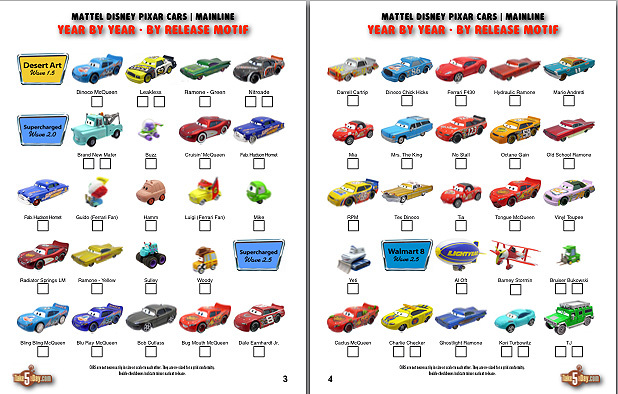 Mattel Disney Pixar CARS: The Year by Year Chronological Checklist + SALE! Many people have asked for it so here it is, a complete checklist of Mattel Disney Pixar CARS in chronological series order From Day 1 in 2006 to Day 1,826 in 2011. This checklist only shows each CAR once – in the series of release (unless there was a major variant re-release). To avoid confusion, I left out “repeating” minor variants and simply added a second check box for minor variants. They are alphabetized with each series/design motif and/or within each wave. Early series tended to have gaps so some are grouped by wave. Of course, you can check out a full preview by clicking on PREVIEW under the magazine cover at MagCloud. 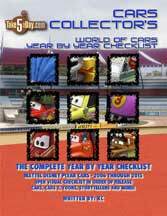 The Motor Speedway of the South set is not included – because if you have the set, you obviously have all 36 racers but more importantly, if you were collecting along the way either as your only racer set or a second set, this check list will be more useful for you. The rubber tire releases are listed here. Just for the record, there were 35 rubber tire releases – missing only the Apple CAR. There were 33 racers released with plastic tires at “retail.” Missing only the Apple Car, Tach O Mint and “Aggro” Dale Earnhardt Jr. Technically Faux Wheel Drive & Gask-its were only available as European promo CARS but they are relatively easy to trade for or buy so they are included in the checklist separately. Final count – 554 CARS which breaks down as 330 mainline singles (and oversized and haulers) plus 102 lenticulars; and Expanded Universe: 24 Storytellers (including Holiday), 93 Toons & 5 Disney Store/Theme Park CARS in the same scale … of course, you will have more or fewer depending on your collector category. What is the difference between this and the other COMPLETE OPEN CHECKLIST? The main difference is that lists all 550+ CARS in one giant alphabetical order checklist while this breaks it up by theme/year/wave/motif in chronological order. But just follow the links to MagCloud – click on the PREVIEW and decide what you like better. Enjoy and thanks for your support of TakeFive! BTW, there is ALSO A SALE through Mother’s Day so each issue is also @$1-$3 off! (the sale % is based on the cost to use so it’s a little confusing % wise but the sale price is clearly listed below each issue). Thanks again! I love the checklist. Is there one for all the Cars 2 vehicles somewhere? Just ordered my issue. Since there are no actual Cars on the store shelves to collect, this is the next best thing! I love Cars and I love lists, so Cars lists just make me go “ahhhh”.